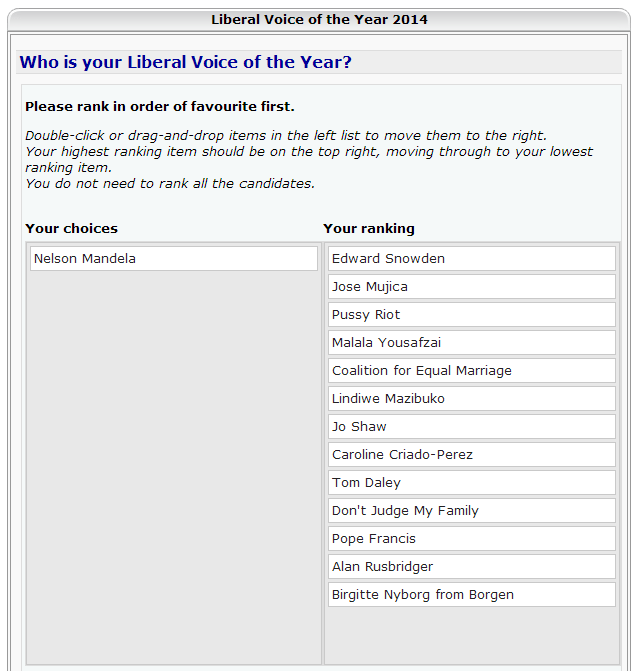 For the last fortnight, LibDemVoice has been asking our readers who they think deserves the accolade, Liberal Voice of the Year, now in its seventh year. The short-list was chosen by current Lib Dem members in our most recent survey: the 14 nominees all had to be separately mentioned by at least four individuals to be eligible for inclusion. The twist is that none of them can be current Lib Dems, forcing us to look beyond party label to recognise the liberal achievements of people who aren’t big-l Liberals. I think it’s our strongest short-list ever: there’s not a single name on the list I think doesn’t merit inclusion on liberal grounds. The only person I didn’t place was Nelson Mandela. He is, of course, a Liberal Hero. But I didn’t think he really counted as Liberal of the Year, given his achievements lie in the past, but placing him in anywhere other than pole position seemed wrong somehow. Reading your write up about him I can see I underestimated Jose Mujica. According to LDV all he did was legalise marajuna – a policy I agree with but in itself not much to write home about. However when you add up the other things that you mention then he ought to have been in my top 3. Somehow I missed that story n the media. no one has yet expaliend why tom daley is regarded as Liberal..